Earth laughs in flowers is an oft quoted phrase plucked from a line of the poem Hamatreya by Ralph Waldo Emerson. Removed from the context of the poem, the phrase evokes a magnificently poetic personification of Earth's flora. Within the context of the poem, earth laughs in flowers assumes a different meaning. Emerson chides the long-deceased settlers of Concord for their braggadocio and for having a sense of ownership over the flora and fauna. He mocks the boastful boys with the image of flowers laughing at their hubris. Emerson foreshadows the Earth-Song poem within this poem. In the Earth-Song part of the poem, Emerson places humankind in the fitting perspective of an Earth that endures and Stars that abide. The personification of Earth's flora is curious particularly upon close inspection of a flower. A flower is, foremost, an intricately specialized reproductive system. A flowering plant is aptly called an angiosperm. We assign the constituent parts of a flower with female ♀ and male ♂ gendered functions. Perhaps one purpose of labeling the constituent parts as such is to understand plant reproduction in a similar context to human reproduction. ♀Stigma is the tip of a style adapted to trap and receive pollen. The stigma germinates the pollen grain containing male reproductive cells. ♀Style is a tube on top of the ovary where ovules are produced. Ovules eventually develop into the fruit and seeds. ♂Stamens are the pollen-producing reproductive organs. A stamen has an anther that produces pollen and a filament that supports it. The pollen consists of the male reproductive cells that fertilize ovules. 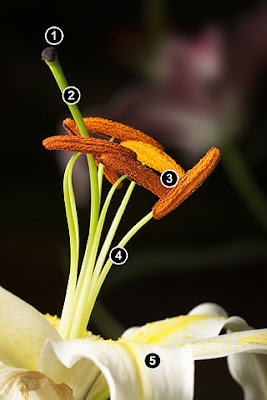 ♂Filament is the slender stalk of a stamen that supports the anther (where the pollen develops). Tepal is the outer part (petals). Emerson's Concord settlers seemed enchanted by material possessions. Perhaps the settlers failed to appreciate the irony that death would turn them into "a lump of mould". Emerson's Concord settlers became part of the land they possessed. Hamatreya, published in 1846 by Ralph Waldo Emerson, Poetry Foundation.